DO YOU OR SOMEONE YOU KNOW DESERVE AN EXTRA SPECIAL HOLIDAY? 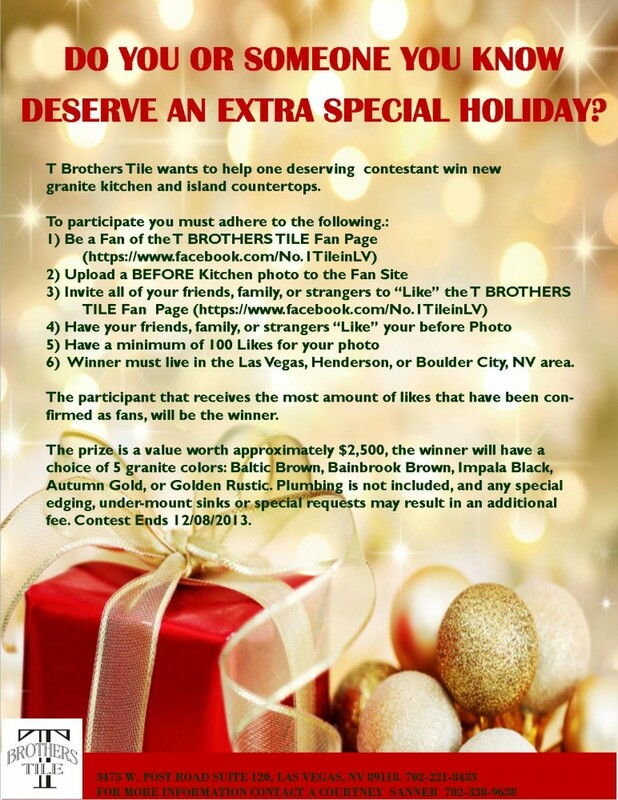 T Brothers Tile wants to help one deserving contestant win new granite kitchen and island countertops for the holidays. 6) Winner must live in the Las Vegas, Henderson, or Boulder City, NV area. The participant that receives the most amount of likes that have been confirmed as fans, will be the winner. The prize is a value worth approximately $2,500, the winner will have a choice of 5 granite colors: Baltic Brown, Bainbrook Brown, Impala Black, Autumn Gold, or Golden Rustic. Plumbing is not included, and any special edging, under-mount sinks or special requests may result in an additional fee. Contest Ends 12/08/2013.